Former CEO of Aurora Media Peter August has a new position. August has acquired The Invader and is working as its publisher. News story followers of the Port Charles newcomer who arrived in the city last November are aware of his shocking connections to Cesar Faison, the mastermind international criminal who has terrorized the city and WSB Agent and former Police Commissioner Anna Devane. Mr. August took the time from his busy schedule to set the record straight for our readers. Writer’s Note: This is a fictional interview with Peter August. 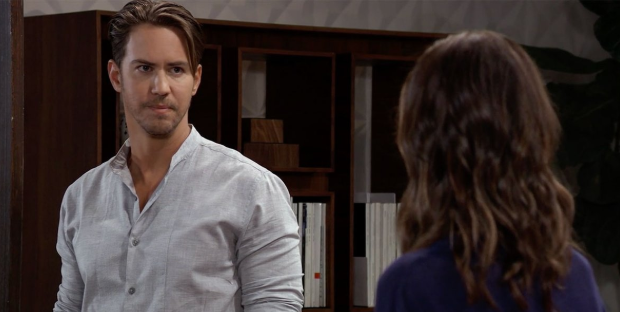 The questions and answers are the author’s interpretation and have no affiliation with Wes Ramsey, who plays Peter, ABC and writers of General Hospital. Thank you Mr. August for agreeing to speak with me. Okay Peter. There’s been quite an amount of press detailing your alleged crimes. What can you tell me about Jason Morgan’s disappearance for five years? Our sources tell us that your funds were seized because of your father’s illegal activities, how were you able to come to purchase The Intruder? Moving on then. The Invader has been known as a paper how can I put this…that is a tabloid. After being the CEO of Aurora Media, why would you have an interest in it? And you poached reporter Lulu Falconeri from the Port Charles Press to write some of these pieces? When she wrote that piece on Henrik Faison, who turned out to be you? How does it feel hiring the writer who aired your past out for the public to read? Ms. Falconeri was the one who alerted the world to all the criminal activities you committed on behalf on your father. So you didn’t keep Jason Morgan captive for five years? What about your brother the late Detective Nathan West, your vendetta against your father didn’t cause his death? What about his widow Maxie Jones, are you pursuing a relationship with her? And your mother Anna Devane…where does it stand in that relationship? What about Liesl Obrecht? She’s still out there, do you fear that she’ll come after you and try to kill you again? Thank you Peter was this insightful interview. I’m sure our readers will enjoy this look inside the man who has been the focus of speculation.